S. M. Soto is an author and romance junkie who enjoys writing novels with relatable characters. Her love for reading began when she was a young girl and has only continued to grow into adulthood. Born and raised in northern California, she currently lives with her son. SM Soto amazes me and this series just gets better as it grows. With Creed now been sworn in with his father, Garrett and the guys are left babysitting Sophia. 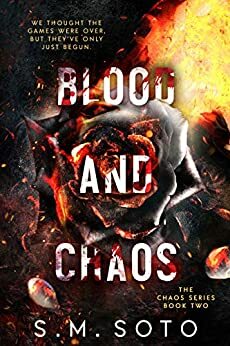 I was totally on edge with Blood and Chaos (the title totally is what is given to us). I couldn’t even sit still while I was reading at how intense this story unfolded which gave me anxiety. There is so much more blood, death and chaos, the guys are back again with more craziness more violence more blood but it doesn’t take away the more the story unfolds, you understand Creed more and he’ll stop at nothing just to keep Sophia safe, from his father and her stalker Finlay. It’s a hard pill to swallow when at times I imagine slapping Sophia but being pregnant and trying to stay safe, it does drive you a little emotionally. ruthless and he’s super alpha that no matter what and where he’s going, he is always, always making sure that Sophia’s love and safety is protected but that ending OMG what were you thinking SM Soto you again gave the crazy, Fin. Book two starts where from the cliffhanger from Book one. Once again this was hard to put down and another book hangover. Sophia finds herself alone and pregnant in this book and wanting only to be with CReed. Creed for Sophia's protection has left her at his home with her brother Garret for her protection. While Creed stays at his father's place to help his father with the family mafia business. Therefore he doesn't want Sophia anywhere near him for her protection as others will be after her if they know he has someone important and able to be used as a bargaining chip. Like always nothing goes according to plan as Creed soon finds out. I can't tell you too much more as I don't spoil the story for you. This book is also graphic with violence and abuse so if these are triggers for you may not be the book for you. Once again the book ends in a cliff hanger and I can't wait for Book three Love and Chaos to come out later in the year. This book starts straight off from where we left Sophia and creed in book one and god this book was just as explosive, if not more, than the first book. It drags you in and keeps you in its clutches and just when you think things are looking up and it can’t get any worse for the characters - it does. We cannot recommend these books enough. Just need to end of February to arrive quickly so I can find out what happens next. Loved it. 5.0 out of 5 starsMy heart didn’t just break reading this, it freaking exploded! I finished this book ages ago, but I couldn’t leave reviews them, but here I am. This story broke me; it’s brutal, the first book was terrific, but book two is even better. Creep made us glue to our Kindles, a fine specimen of alpha male. I have all these feelings, reading this book, I got myself shouting to my kindle, how this is possible, common! The author destroyed your heart in tiny million pieces, and then she glued to kill again, I love this game, because I keep coming back. My heart was pounding so severely reading this book, and I love every minute of it. My heart didn’t just break reading this, it freaking exploded! I'm not sure where to start with reviewing this one. I finished it a few days ago but couldn't contemplate writing a review til now. I'm more than a little obsessed with Creed and the journey he's on. Yep, more than a little obsessed. This story is gut wrenching, it's brutal, it's action packed and it's a roller coaster of emotions. SM Soto manages to make me question what I felt certain of from book 1 and she also makes me hate a character so much I want to kill him with my two hands. Major cliffhanger had me throwing my Ipad and yelling Noooooo!!!!! Absolutely recommend if you like your stories dark and emotional. I’ve been itching to get my hands on this and I wasn’t disappointed- picking up where Deception and Chaos left off, we’re thrown straight back into the action, the story is fast paced and full of twists and turns. Full of action and drama, I didn’t want to put it down! I cannot wait for the 3rd and final instalment of Sophia and Creed’s story!